By Dr.Shirley A Pomponi, Ph.D.
For thousands of years, people have taken advantage of nature’s ability to produce remedies to treat diseases and ailments. In some parts of the world, natural medicines are still the only treatments available. Scientific research on these natural medicines, called “ethnomedicines”, led to the discovery of purified chemicals, whose beneficial properties provided the foundation of the current pharmaceutical industry. Today, over half of the marketed drugs are either extracted from natural sources or produced by chemical synthesis using natural products as templates or starting materials. Drugs such as morphine, Taxolâ, aspirin, penicillin, vincristine, and cyclosporin are just a few examples of drugs derived from terrestrial plants and soil microorganisms. Why Look to the Oceans as New Sources of Drugs? The oceans are a rich source of both biological and chemical diversity. They cover more than 70% of the earth’s surface and contain more than 300,000 described species of invertebrates and algae-and we believe that this is just a small percentage of the total number of species that are yet to be discovered and described! A relatively small number of marine organisms that we’ve studied to date-primarily algae and invertebrates-has already yielded thousands of new chemical compounds, but only a small percentage of these chemicals has been studied for their potential as drugs. Finally, although there is a major effort by the pharmaceutical industry to design synthetic drugs using molecular modelling techniques, marine natural products still provide unusual and unique chemical structures upon which molecular modelling and chemical synthesis of new drugs can be based. Why do marine plants, animals, and microbes produce chemicals that are useful as pharmaceuticals? Many of them are sessile-attached to the bottom, and they live in densely populated habitats where competition for resources, such as space and food, is intense. As a result, they have evolved a unique arsenal of chemicals used for their defense, reproduction, and communication. Fortunately for us, many of these metabolites also interact with enzymes involved in human disease processes. 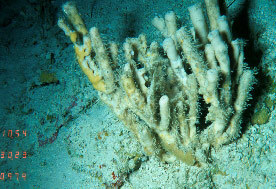 If, for example, a sponge is trying to prevent a coral from invading its space, it may produce a chemical to prevent the coral cells from growing and dividing. It is not unusual, therefore, that these same chemicals may also be effective in inhibiting the uncontrolled growth of cancer cells in humans. In fact, several marine-derived chemical compounds are in preclinical or clinical trials for the treatment of cancer. Some anti-tumor compounds from marine sources that are currently licensed for development (data courtesy of Dr. David J. Newman, NIH, National Cancer Institute, Natural Products Branch). Our team at HARBOR BRANCH Oceanographic discovered discodermolide in a deep-water sponge called Discodermia, pictured above. 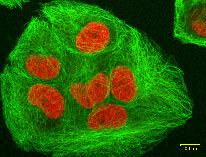 This drug inhibits the proliferation of cancer cells by interfering with the cell's microtubule network. Despite the emphasis on identifying new anticancer compounds, marine natural products have also been found to have other biological activities, including mediation of the inflammatory response. 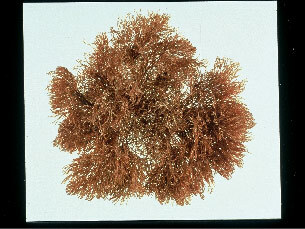 One example is the pseudopterosins, derived from the Caribbean soft coral Pseudopterogorgia elisabethae. 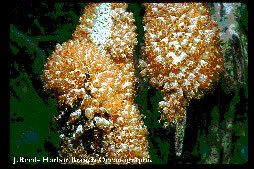 Purified extracts of this soft coral are available commercially as additives in skin care products. 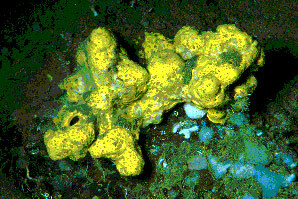 Another example is topsentin, derived from a deep-sea sponge, called Spongosorites. Other marine-derived compounds, such as the prostaglandins, palytoxin, calyculin, okadaic acid, and manoalide, to name just a few, are available commercially as biomedical research probes that give us valuable insights into understanding and treating human diseases. What Are the Challenges to Discovery of New Drugs from the Sea? Quite simply: technology, money, and regulations. Technical challenges include exploring new environments and developing new platforms, tools, and assays to discover and test organisms never before studied. The financial challenge is to obtain adequate support for both exploration and early-phase, high-risk drug discovery research. Political and regulatory challenges involve complying with regulations related to the rights of a country to its natural resources, as well as fair and equitable sharing of technologies and revenues resulting from commercialization of products from marine resources. Successful discovery and development of marine-derived pharmaceuticals will depend, of course, on our ability to address a number of scientific questions. What organism produces the bioactive compound, and why? Can we apply this knowledge to our rapidly increasing understanding of the human genome and human disease processes? Are there viable alternatives to prevent over-exploitation and ensure sustainable use of marine resources for drug development? Let’s examine each of these challenges. Most of the environments explored for novel organisms with unique chemicals have been those which are accessible by scuba. Although bioactive compounds have been identified from higher latitudes, such as the fjiords of British Columbia and under the Antarctic ice, the focus of “biodiversity prospecting” has been primarily the tropics. Aside from the fact that it’s just more comfortable to dive in warm water, tropical seas are well-known to be areas of high biological diversity and, therefore, logical targets for “bioprospectors”. Marine biodiversity prospectors have focused on shallow water benthic environments-areas that can be accessed with relative ease by snorkelling and scuba diving. Precise and focused collection of samples from deeper environments requires more sophisticated technologies, such closed-circuit rebreather diving and submersibles. The focus of our drug discovery exploration program at Harbor Branch is deep water organisms that live on the continental shelves and slopes at depths from 400 to 3000 feet, i.e., beyond scuba depths, using our Johnson-Sea-Link manned submersibles. 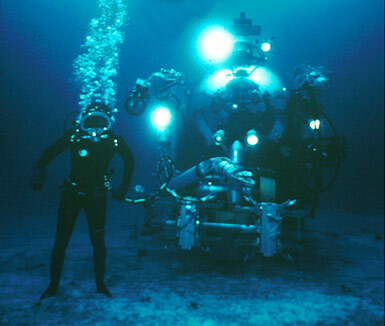 Submersibles provide platforms that enable us to go deeper, stay longer, access unusual sites that cannot be accessed using conventional methods (e.g., steep walls, rocky bottoms, and vent communities), and be more precise and selective in our sampling than can be accomplished with more traditional deep-water collection methods (such as trawling and dredging). There is still most of the deep sea yet to be explored for discovery of novel organisms and unique chemicals that may have pharmaceutical potential. With rare exceptions (e.g., the analysis of deep sea cores to identify unusual microbes), the deep sea bottom, mid-water habitats, and most of the world’s oceans at depths greater than those accessible by scuba or even human-occupied or remotely-operated submersibles, have not yet been explored. The exploration of new geographic areas often focuses on areas outside of US jurisdiction. Indeed, since most of the tropical seas-the areas of focus of most biodiversity prospecting-are under the jurisdiction of other countries, compliance with national and international regulations regarding access, collection of natural resources, and exporting these materials has been an essential element of marine natural products drug discovery research to date. Obtaining permits to work in a country’s territorial waters, to collect samples, and to export those samples involves obtaining permits from and coordinating the interaction of several national and state agencies, e.g., ministries of defense, fisheries, and national parks, to name a few. It is often a lengthy process, and plans for foreign collections must be made several months or even years in advance of the expedition. Balancing the responsibilites of the stewards of marine resources with the requests of marine bioprospectors is indeed a challenge. Environmental resource managers have the responsibility to protect their resources from over-exploitation. Legislators and policy-makers must decide whether bioprospecting is consistent with their plans for resource management. If they decide it is, they must draft and implement policies for access, use, and development of the resources. Still unresolved, for the most part, are issues dealing with fair and equitable sharing of technologies and revenues related to the discovery and commercialization of drugs from marine resources. As a result of the recommendations of the U. N. Convention on Biological Diversity, legislators, bioprospectors, and environmental resource managers have begun to discuss what actually does constitute a “fair and equitable sharing”. How does one place a value on a resource? If, for example, a drug was developed based on a chemical from an organism that is endemic to the country in which it was collected (i.e., it only occurs in that location), should the revenue sharing be greater than if the organism occurs (and was collected) throughout a geographic region and across jurisdictional boundaries? If the organism is harvested to provide the materials for clinical development and commercialization, should the revenue sharing be greater than if only a few samples were collected to identify the active compound and subsequent supply was based on alternative methods? These are just a few of the questions that must be considered when placing a fair and equitable value on a marine resource. Of course, the chances of a chemical compound being commercialized are very low, and the pay-off could be several years from the original discovery. In the spirit of respect for, and acknowledgment of, the scientific capabilities and contributions of the source country, alternative scenarios to sharing of royalties may include more near-term benefits, such as support for development of the scientific infrastructure (particularly for developing nations), training of students, scientist exchange programs, and technology transfer. These are often key elements in a revenue- and technology-sharing agreement. The biological evaluation of marine-derived extracts and pure compounds for pharmaceutical development has been based on tests, or assays, developed by the pharmaceutical industry for high-throughput screening of large libraries of synthetic compounds. They measure a number of end-points, such as activation or inhibition of enzymes or receptors involved in human disease processes, inhibition of growth of human pathogenic microorganisms, and toxicity against human cancer cells. As our understanding of the biochemistry behind a variety of diseases has improved, better methods have been developed for rapidly determining the biomedical potential of the metabolites produced by marine organisms. 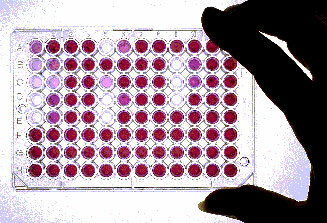 None of the assays used in major pharmaceutical drug discovery programs, however, takes into account the functions of these chemicals in the organism producing them and how those functions may be applied to the discovery of new drugs and probes to study human disease processes. For example, how does a simple organism, like a sponge, through which seawater and associated bacteria, fungi, and viruses constantly flow, defend itself against microbial infections? How does it signal its cells to divide rapidly enough to heal a damaged surface in a few hours, or spread out over a substrate in a matter of days or weeks, yet control this proliferation so that the sponge itself does not get cancer? How, with only a primitive immune system, does it recognize an invading organism as “non-self” and send out chemicals to kill the invading cells, without killing its own cells? We know so little about these processes in the organisms from which we have identified literally thousands of chemicals with biomedical potential. Molecular tools and approaches that have been developed to understand similar processes in mammalian systems must be applied to understanding these processes in marine organisms. A multidisciplinary approach-involving molecular biologists, pharmacologists, and chemical ecologists-to discovery of marine-derived drugs will likely result in the discovery of unique bioactive chemicals and new ways to address the treatment of human disease. Supply of most marine-derived compounds is a major limiting factor for further pharmaceutical development. Often, the metabolite occurs in trace amounts in the organism, and a steady source of supply from wild harvest cannot provide enough of the target compound for even preclinical studies. In general, the natural abundance of the source organisms will not support production based on wild harvest. With the enormous potential for discovery, development, and marketing of novel marine bioproducts comes the obligation to develop methods by which these products can be supplied in a way that will not disrupt the ecosystem or deplete the resource. Unless there is a feasible alternative to harvesting, promising chemicals will remain undeveloped. Complexity of the molecule: can it be synthesized using an industrially-feasible process? Chemical synthesis of a compound gives the pharmaceutical company ultimate control in the supply of materials for clinical development and eventual marketing of the drug. Synthetic processes have been published for many marine bioproducts in development as pharmaceuticals. Unfortunately, most of these are complicated processes that are not amenable to economic, industrial-scale synthesis. To overcome this problem, major research programs are undertaken to identify structurally similar compounds that are easier to synthesize, and perhaps even more potent and less toxic than the “parent” molecule. Abundance of the organism in nature: what do we know about the impact of collections on the environment? There are rare cases in which the bioactive organism actually occurs in sufficient abundance (and may even be a nuisance or invasive species) to allow wild harvest for drug development. 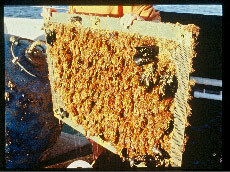 Prior to large-scale wild harvest of an organism for recovery of a bioproduct, however, harvesting feasibility studies should be conducted. These should define factors such as the standing stock of the organism, its growth rate and the factors that affect growth, and the effects of harvesting and post-harvesting recovery of the target organism. These impact data should then be used to assess the potential of supply from wild harvest, and may also be useful in developing models for aquaculture of the source organism. Is aquaculture an option? Both in-the-sea and land-based aquaculture methods have been developed for production of bioproducts from shallow-water organisms. 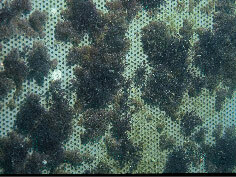 CalBioMarine Technologies (Carlsbad, CA) has successfully aquacultured the bryozoan, Bugula neritina, the source of the antitumor compound bryostatin, and Ecteinascidia turbinata, the ascidian from which the antitumor drug YondelisÒ has been isolated. These are both common, shallow-water organisms for which reproduction and growth have been studied, but the factors controlling production of the compounds are not yet completely known. In-the-sea aquaculture is a cost-effective method of production with opportunities for technology transfer and economic development in the source country, however, it may not afford the opportunity for complete control of environmental parameters or the enhanced production of the compounds. Development of closed-system bioreactors for aquaculture of both shallow water and deep water organisms is a particularly challenging opportunity. Can we just culture the cells of the producer? If the source of the compound is the macroorganism itself, development of in vitro (or cell culture) production methods could provide bulk supply of the compound. Research in progress in our laboratory focuses on establishing cell lines of bioactive marine sponges that can be used as models to study in vitro production of bioactive metabolites and the factors which control expression of production. This could ultimately lead to in vitro production of marine bioproducts. Source of the compound: is it microbially produced? Some marine bioproducts with pharmaceutical potential have been identified from marine microorganisms isolated from coastal sediments. In addition, some marine bioproducts originally isolated from macroorganisms, such as sponges, have been subsequently discovered to be localized in microbial associates or symbionts. If these microorganisms can be isolated and cultivated, optimization of production in marine microbial bioreactors could lead to an industrially-feasible supply option. Biosynthetic pathway: is genetic engineering realistic for the compound? If the biosynthesis of the target compound-the way in which the molecule is produced by the marine organism-is understood, it may be possible to identify, isolate, clone, and express in a heterologous host (i.e., in an organism different from the one that naturally produces the compound) the genes responsible for production of the metabolite. In many cases, of course, biosynthesis of the product is not known, or it is a multi-step process involving several enzymatic reactions. For these cases, transgenic production is not a trivial process. Nevertheless, “recombinant production” of bioactive marine natural products is the focus of intense research efforts in several labs, including our drug discovery program at Harbor Branch. So, how soon will it be before new drugs from the sea are available? From the time an organism-like a sponge or a sea fan or a tunicate-is collected, and a novel, bioactive chemical is identified, it usually takes at least 10-15 years before the drug is available. A lot of “preclinical” research must be completed to determine the mechanism of action and to test its safety in animal models. Only then can an application be submitted to the FDA to begin testing the drug in humans. The process of human clinical trials can take from 5 to 7 years, or longer. Fortunately, there’s a group of marine-derived drugs that are in the clinic, and we expect that PharmaMar’s YondelisÒ will be the first to get approval-hopefully, within the next year. As a result of recommendations from several blue-ribbon panels, federal agencies, like NOAA, NSF, and NIEHS have joined the ranks of the NCI in establishing new programs for discovery and development of marine-derived pharmaceuticals (e.g., the soon-to-be-funded Centers for Oceans and Human Health). We now have the unique opportunity to capitalize on new technologies developed to explore the oceans of Earth and other planets (e.g., probes, sensors, and miniaturized tools that can function in “hostile” environments, like the deep sea), recent discoveries in medicine and molecular biology (e.g, the human genome project), and a greater appreciation for the value of marine resources to realize the full potential of our oceans and human health.